Welcome to one of the most remarkable—and unique—journeys homeowners will ever take. The fact that you’re here means that you’re ready to embark on making your dream a reality! As with every journey, you begin by preparing yourself with what’s necessary to make it happen. We’d love to help prepare and equip you to experience your dream. 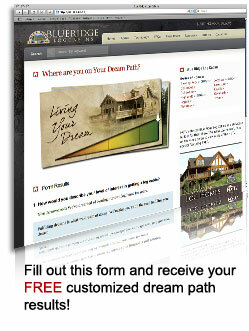 We have the tools to help you walk down your dream path to owning your own log home. We’re excited to be on this journey with you. For now, help us get acquainted with you by telling us a little about yourself and answering a few short questions that will allow us to focus on what’s important to you. Where are you on the Dream Path to log home ownership? Once you answer the questions, we’ll immediately provide you with the information you need to make the next step.